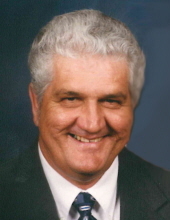 Celebrating the life of Paul Nathan Shore, Jr.
Obituary for Paul Nathan Shore, Jr.
Mr. Paul Nathan Shore, Jr., better known as “Junior”, age 77 of Hamptonville, went home to be with the Lord Monday, April 1, 2019 at Iredell Memorial Hospital. Funeral services will be held 11:00 AM Saturday at Union Baptist Church in Hamptonville with Rev. Kenny Pardue officiating. The family will receive friends from 6:30 until 8:30 Friday evening at Reins Sturdivant Funeral Home. Burial will be in the church cemetery. Mr. Shore was born October 24, 1941 in Wilkes County to Paul Nathan Shore, Sr. and wife Louise Gregory Shore. He was retired from the textile industry and farming. Mr. Shore was a member of Union Baptist Church in Hamptonville. Mr. Shore is survived by his wife of almost fifty six years; Brenda Chambers Shore, three children; Kamela Shore Greene and husband Chris of Ronda, Derrick Shore and wife Karen of North Wilkesboro and Chad Shore and wife Liz of Hamptonville, eight grandchildren; Kaleb Hemric and wife Carrie, Logan Hemric and wife Brittany, Lariat Hemric and wife Celyna, Danielle Shore, Kandis Shore, Bryson Shore, Brady Shore and Brylee Shore, two great grandchildren; Weston Hemric and Mila Hemric, a brother; Larry Shore and wife Debbie of Hamptonville, two nephews; Brandon Shore and wife Erica and Justin Shore and wife Lindsey, great nephew; Mason Shore and great niece; Aubree Shore. To send flowers or a remembrance gift to the family of Paul Nathan Shore, Jr., please visit our Tribute Store. "Email Address" would like to share the life celebration of Paul Nathan Shore, Jr.. Click on the "link" to go to share a favorite memory or leave a condolence message for the family.